﻿Passionate about animals and the field of psychology, Nildan’s venture into canine behavioral sciences began approximately 15 years ago when she got a cute little puppy whom, to her surprise, had a multitude of issues ranging from resource guarding, to body handling issues, to owner-directed aggression, and fear–based reactivity toward people and other dogs. Through extensive education, experience working at a dog daycare facility, and volunteering at the ASPCA in New York City, Nildan gained the knowledge, skills and expertise necessary not only to help her own dog but also to pass the certification exam so she could help others with their canine challenges. To that end, Nildan has started working with Dorchester Paws Animal Rescue in Summerville, training the challenging dogs to become more adoptable while assisting the organization in building their animal training and volunteer programs. Knowing that proper care and treatment of animals comes from having accurate knowledge, Nildan has begun teaching seminars at Trident Technical College to educate pet owners in our community on canine behavior based on current research findings. Nildan holds degrees from various academies and a national certification from the Certification Council for Professional Dog Trainers (CCPDT.org). Nildan continues to work one-on-one with her human clients via in-home private sessions and also offers group classes at her indoor training facility in West Ashley. Her training methodology focuses on motivational and positive reinforcement-based techniques, with an emphasis on building rapor and cooperation between dog and owner. Nildan has competed in Rally Obedience, achieving First Place titles with their family Labrador retriever. Now a resident of Charleston, SC, Nildan and her husband share their home with their 4 senior chihuahuas and their Azorean Cattle Dog (Cao Fila de Sao Miguel), on right. The Neurobiology of Animal Behavior, Medications for Dogs with Behavior Issues, Aggression in Multi-Dog Households, Role of Breed Characteristics in Behavior Responses with Dr. Karen Overall, Diana Pappert, Veterinary Behaviorist Dr. Soraya Juarbe-Diaz, Diane Garrod, Ken McCort, & others. Certified Professional Dog Trainer – Knowledge Assessed (CPDT-KA): Designation provided by the Certification Council for Professional Dog Trainers (CCPDT.org), the first national, non-affiliated certifying organization to establish and maintain a recognized standard of proficiency in the industry, setting the criteria in continuing education, standardized testing and assessment, and work experience. The CPDT-KA exam is the only psychometrically sound, NCCA accredited, legally defensible credentialing examination available to dog trainers. academic categories requiring written, oral and hands-on demonstration and testing of student's canine behavioral knowledge and skills application. consisting of written and hands-on training courses. A worldwide association of dog trainers, APDT provides educational and networking opportunities for trainers to improve their knowledge and skills, and grow the profession with a standard of excellence. An international association committed to promoting and educating the public on force-free training. 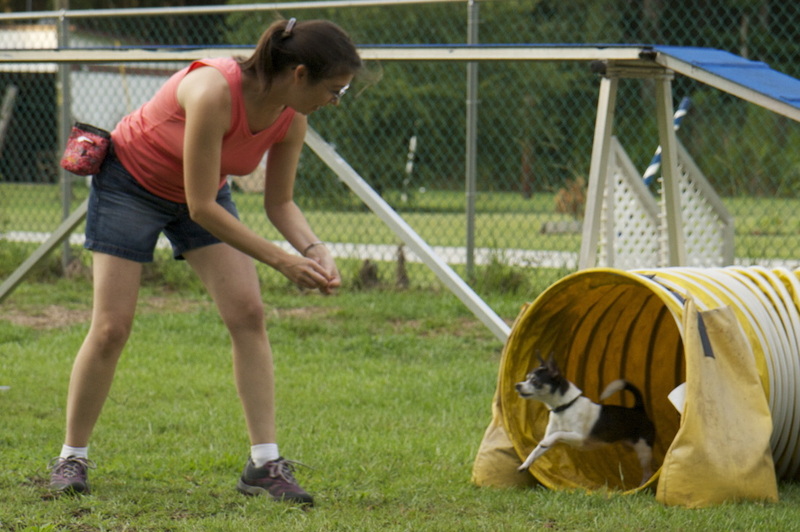 Doing Agility with her chihuahua, Zack. Working on rear-end awareness with Belgian Malinois puppy. Working with sled dog, Bear. Caroline Hunt has been teaching college students for more than fifty years, and dog and handler teams for over twenty. She is a member of the National Association of Dog Obedience Instructors (NADOI) and of the Greater Columbia Obedience Club, a former editor of several dog publications, and a longtime Canine Good Citizen evaluator for the American Kennel Club. She has lived with Pointers, Golden Retrievers, unidentifiable terriers and spaniels, German Shepherd Dogs, and Shetland Sheepdogs, nearly all rescues with varying degrees of baggage. Her past and current dogs hold AKC titles in Rally, Obedience, Agility, Therapy, Farm Dog, and Tricks, and in non-AKC venues such as USDAA, UKC, and CDSP. Magnus, her main competition dog, was #1 in the country in CDSP Novice C and has competed at Shetland Sheepdog Nationals and at AKC Rally Nationals. Seminars attended include agility with Bud Houston, Windi Williams Weaver, Tracy Hirsch, canine conditioning with Rebecca Thrift, and competitive obedience with Jane Johnson, Chris Elliott, Denise Fenzi. She is a strong proponent of online learning and has participated in formal programs by Susan Garett and Denise Fenzi as well as in titling programs through the International Dog Parkour Association (parkour) and Do More with Your Dog (tricks / stunts). A life member of Low Country Dog Agility, she taught CGC classes there for many years, as well as Rally Obedience at SCoot Dog Agility. She has worked with eight therapy dogs at local hospitals and nursing homes and is a past president of Southeastern Therapy Dog Resources (STAR). Sue Krom is a Certified Dog Instructor with NADOI. She is also a CDSP Judge and Representative, as well as an AKC Evaluator. She has trained dogs since 1974. She owned and titled 7 Dobermans and 3 Min Pins. Sue believes in cross training and since moving to South Carolina from Massachusetts in 2015, Sue has titled in Coursing and Fast Cat. Her Min Pins have titles in conformation, obedience, rally, trick dog, agility, barn hunt, dock diving, and coursing. Her dog Metro recently got his CDX in CDSP and will be getting his UD before returning to AKC. Sue also showed her Champion dog Lulu in conformation at Westminster. All of her Min Pins have their Triple Crowns - 3 titles, 3 different venues. Metro was #5 in the country in Obedience. Her new puppy, a 6 month old German Pinscher, Jack, just earned his Novice Trick Dog title at 5 months of age. Sue recently attended a 2-day intensive seminar with Andrew Ramsey on Scent Detection in preparation for future Nosework trials. Her Min Pin, Madison who participated in the seminar, learned to detect and search for scent. One of Sue's goals is to get more types of shows going in the Charleston area. She is a positive trainer with many games and tricks in her toolbox. Heather has been training dogs for 9 years. In those 9 years she has volunteered at animal shelters bringing love and training to the dogs waiting to be adopted. Heather graduated from Animal Behavior College as a certified dog trainer and went on to complete their program in Training of Shelter Dogs. She has continued her education over the years with Natural Dog Training, has become an AKC evaluator of the Canine Good Citizen certification, and is an instructor of agility for fun classes. Heather is committed to a happy/healthy relationship between owner and dog, so her method of training is based in positive reinforcement. Katherine (Katie) has worked in the veterinary field for over 10 years and pursued her passion for animal care and rehabilitation by obtaining her certification as Canine Rehabilitation Practitioner (CCRP) at the University of Tennessee. Currently she continues to lecture and co-educate at the University of Tennessee and other sanctioned facilities teaching associated rehabilitation and fitness courses. Proceeding further into the fitness realm, submitting intense case studies and taking extensive exams, Katie was awarded her Certified Canine Fitness Trainer (CCFT) and Canine Fitness Master Trainer Instructor (FT-MTI) certifications. Upon completion of her certifications Katie began work at the Regional Institute for Veterinary Emergencies and Referrals in Chattanooga, Tennessee. Katie has worked with canines of all sorts, from performance athletes attending national championships, to working dogs returning from their line of duty. With her passion for helping and caring for canines, in 2014 Katie founded the Knoxville, Tennessee chapter of Dogs on Deployment, a non-profit organization that cares for pets belonging to deployed, and otherwise committed, military members away on duty. Katie currently resides in Charleston, SC with her canine athlete, Zeke, a young, robust Malinios she often uses for live demonstrations in her fitness workshops across the country. Katie has been one of the leading practitioners in Charleston Veterinary Referral Center’s (CVRC) Animal Physical Rehabilitation and Sports Medicine Department since 2016.